Programs like Medicare, Medicaid, and Social Security may be safe from the government shutdown because they’re deemed mandatory and essential spending, but other agencies aren’t so lucky, and workers across the country are paying the price. Around 800,000 federal employees don’t know when they’ll receive their next paycheck. 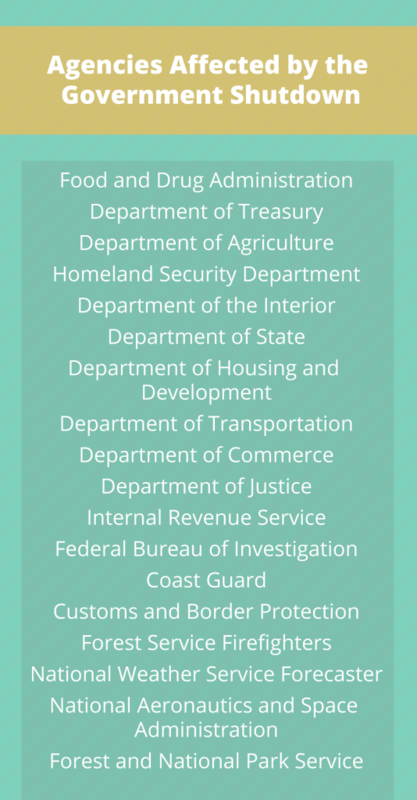 During this particular shutdown, 400,000 federal employees are expected to work without pay and another 350,000 employees will be furloughed, or granted an involuntary leave of absence without pay. Furloughed employees will still have jobs when the shutdown ends and will retain their benefits in the meantime. On January 16th, President Trump signed a bill that will provide federal workers with back pay once the government reopens. 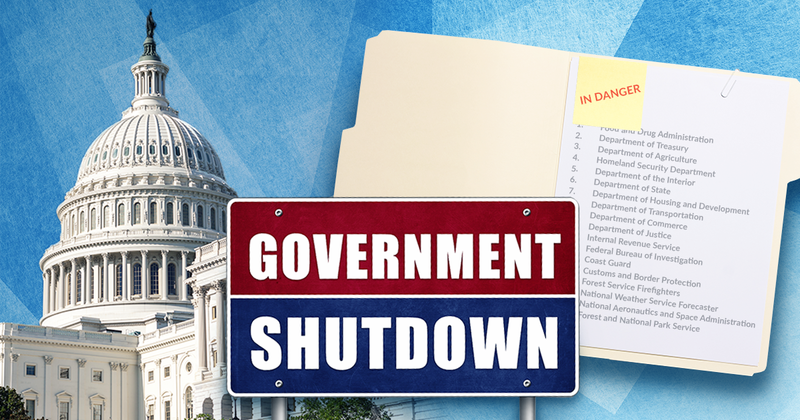 However, that still leaves many government employees who live paycheck-to-paycheck on modest salaries in dire financial straits as there is no end in sight to the shutdown. One agency impacted by the shutdown is the Food and Drug Administration (FDA), and this could be trouble for Americans across the country. Funding for routine food inspections has suspended, meaning the United States could potentially see an increase of food-borne illnesses and death in the coming months. The FDA will continue inspections of imported food, but 70 percent of all domestic inspections have been halted. Particular high-risk foods that will not be inspected during this time include breakfast cereal (salmonella), romaine lettuce (E. coli), and ice cream (listeria). Cheese is also considered a high-risk food, but meat and most egg products are safe as they’re inspected by the Department of Agriculture’s Food Safety and Inspection Service, which is still funded. Federal employees working without pay include 41,000 workers in the Drug Enforcement Agency; the Bureau of Alcohol, Tobacco, Firearms and Explosives; and thousands of other law enforcement and correctional officers, including many in the FBI. The IRS has furloughed around 52,000 staff members, which could lead to delayed tax returns for millions of Americans. After a 2013 government shutdown, the Office of Management and Budget estimated that taxpayers spent $2 billion due to the lost productivity of furloughed workers. The House has passed two bills that would reopen the government, but Senate Majority Leader Mitch McConnell has refused to bring them to a vote on the Senate floor despite support from both sides of the aisle to reopen the government.